We had a rotten fence replaced by our gardeners 3 years ago. They replaced all the concrete posts and woodwork. This was not a cheap job and we paid close to £2.5K in total. 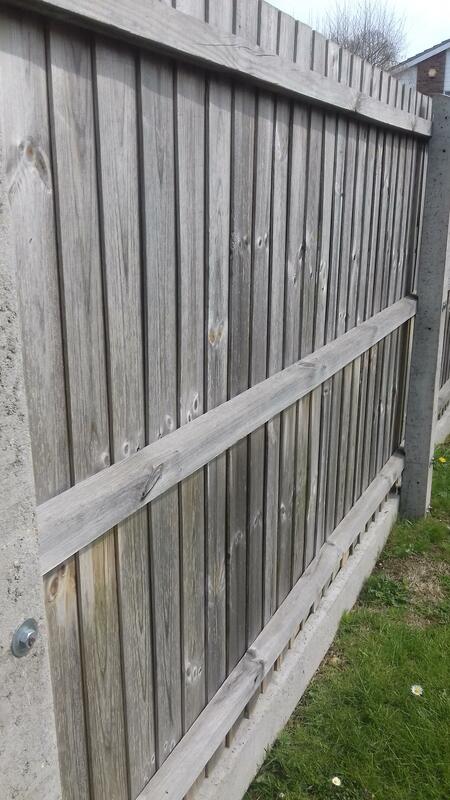 The concrete seems to have been well done but the wood seems to have shrunk substantially and gaps of up to 1½cm have appeared between the slats. I have complained to the gardeners whose suppliers state that shrinkage is to be expected in warm, dry conditions. We have not seen similar shrinkage in any other exterior woodwork here. We have five wooden sheds and gates, replaced in 2000, have not shrunk. I think they've used wet wood and are trying to fob me off. Even for very wide boards, the drying shrinkage one would expect for outdoor boards, that were even reasonably air-dry when installed, would not be that great. What's the between-board gap when it is cold and damp? Don't let them blame it on global warming. It is likely the panels were supplied wet. I had the same problem during those storms in the early 2000s and you couldn’t buy wooden panels for love or money. That was due to the forest damage in Eastern Europe coupled with the obliterated fences in the U.K.
On one panel I fitted, you could fit your whole arm in between the slats. I complained on behalf of my client and was fed the ‘read the small print on timber’ bud. I dug my heels in and proved it was unreasonable and unfit for purpose and won. They realised they would have lost me as a customer. They didn’t give two hoots about my client. However it was resolved and everyone was happy eventually. I would decide weather YOU think the warping/shrinking is reasonable and approach your gardener. He should then sort out the situation if need be. If not, then it gets a little more tricky. Citizens’ Advice Bureau will give you some good early advice then unfortunately if you still feel aggrieved you may have to go down the Trading Standards Route. I will warn you though, Trading Standards is there as much to protect your gardener as it is there to protect you, so ensure your claims are reasonable in the first instance. I hope it all works out and I’m sorry it is so stressful. Horrible business. If this is a claim after the work was completed after more than 12 months ago, you probably don’t have very firm ground to stand on with your gardener. You say 3 years. However I wonder if you have any warranty or guarantee information on the fencing? Do you know who made them? Grange, Jackson, Jewson etc? Because of the 12 month issue, you may have to take up the warranty/guarantee issue direct with the manufacturer. I think your gardener is out the loop. Unless you regularly use him/her in which case they may feel it is in their interest to help you. The good news is that as you have concrete posts, it is easy to slot in a new panel if it comes to that. Not expensive from a labour perspective and worse case scenario: Buying new panels may be better than going through a stressful war with your gardener, TS and suppliers. AS HC wil no doubt bear out, the bulk of your original cost is labour. A replacement panel is (relatively) cheap - a decent local supplier to us charges between £16 (heavy duty lap panel) and £28 (vertical closeboard feather edge) per 6' x 6' panel. At 3 years, I think getting replacement panels would be the least stressful outcome, and perhaps a friend or two to help slot them into place. "Larchlap" fence slats are (these days, at least) very thin, and prone to shrink and warp IME. If I were replacing the panels I'd go with close boarded ones. Those are very good prices. 4' x 6' close boarded £35 here. 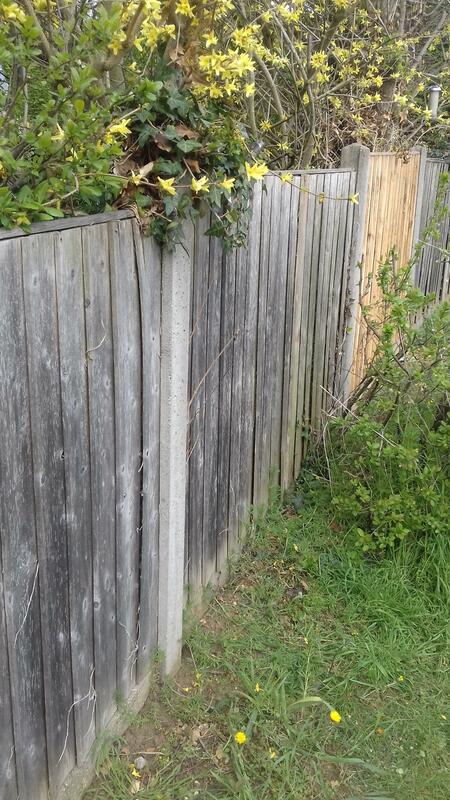 We had a fence built using concrete posts and 6x6 wooden panels many years ago. The posts are still fine, but panels have been replaced as and when required several times. These days I tend to buy pairs of 6x3 panels and slot one above another in each space, they are easier to handle and I can collect them in my car. Ones from the likes of Wickes are very flimsy, worth buying better quality ones from a fencing supplier. I'm not too far away, can give your partner a hand slotting new ones in. We have more trees than Cambridgeshire . They're a fence and gate manufacturer based in Wendover Woods in the Chilterns, so perhaps get good prices from the Forestry Commission, plus no reseller mark-up. 4' x 6' close boarded is £26. Shoes again, it's labour that costs, not material. However, 15 miles down the road, a timber merchant charges £36 for a 6' x 6' close boarded. We had our fences replaced (probably about 25 panels, with concreted posts etc.) about three years back. Our handychap did the labour (and he painted them last summer, he did say best to leave them a few years before sealing). I think they were pressure-treated panels, so I assume they impregnate them with some kind of wood preservative. They came from the local hardware place as opposed to one of the big DIY palaces, and were apparently 'made in Britain' (something so uncommon these days, I noted it). Anyway, I can't say I've noticed any significant gaps or shrinkage in the actual wood, the only problem we had was with a garden gate that warped away from the frame each time it got wet and needed a bit of wood screwed to it to keep it straight. I'd benchmark them against some local examples of similar fences, but as said, after three years, you're unlikely to get much traction with a complaint. The fence was built from overlapping vertical slats by the gardeners, who do the regular work here. Fencing panels were not used. The slats are ?10 cm wide and the gaps are around 1cm. They built the fence in March 2016 and shrinkage was apparent quite soon. I told them of the issues late last summer but although they said they'd contact the suppliers heard no more. Unsurprisingly, the gaps are still evident after a wet winter. Any chance of a photo? If the posts are slotted and at appropriate centres panels can be bought which emulate hit and miss fencing (But are not the same). If bolts and plain posts with rails have been used is puzzling why the overlap provided does not allow for shrinkage or are the panels just on one side? Edit reading again looks like a close boarded fence which now has gaps. I have had Flickr issues I've been too lazy to resolve, due to the Yahoo email/flickr business so I don't have access to my flickr account. I'll put some on Facebook and link here. Looks like David took these photos last spring. Mmm. Poor batch of timber probably, but all fences eventually go this way but usually after longer periods of time. I wish suppliers would pressure treat as a matter of course. May look worse than it is due to eye being drawn to gaps. We have had some very wet weather followed by some very dry. I think you have been unlucky to only get three years prior to this. I would get the gardener to replace worst offending individual boards over a period of time in small batches during visits and pre treat them before fixing, replacements are readily available. Simple to do. High pennies for individual boards. I suspect a few replacements will make a huge difference to how you feel about the fence. Cant tell from photo if there is a mid rail. Should be and boards fixed here also. About six years old. Note view is not towards the gaps. Slide in panels at least 10 years old. Affected also by vegetation from next door. I agree that the above photo could be misleading due to the angle of the photo, but it really doesn’t look like they have allowed enough of an overlap judging by the feather edge board that has been painted and shows an unpainted area. But that could be hard to judge from a photo due to scale. How many rails are there? I can’t see from your photos. As per @canardly ‘s picture, a minimum of three would curtail warping to a degree. Your gardeners skimped on your fence. From your photos there appears to be no mid rail which is allowing the the boards to warp out of the plane of the fence on drying. The overlap used (which allowed fewer boards to be used) was insufficient to accommodate the shrinkage on drying. They appear to be gardeners, not fence builders. I would get them to remake by removing the boards, adding a third (centre) rail then refitting the boards with bigger overlap (or the same overlap now the boards have shrunk) with additional boards to make up for the gap. Yes I agree and posts preferably at 2m cs subject to budget. No photos, but ours look a lot sturdier, there's ample triangular cross bars, metal bracing, and there's certainly no gaps to be peered through. That said, our handyman is a pretty much a stickler and we live on a potentially windy and exposed hillside. He would have bought decent panels because after the bendy interior doors experience I figure cheap is never actually cheap and they're supported by more concrete than the Shard. There is definitely no top or middle rail. To be honest, I don't know if there's even a bottom rail as I can't get outside to look. Their website boasts they do fencing so I would have expected a quality job for the money. There is a top rail Helly but middle one appears to be missing. Hence comments that they have skimped on material where inadequate lap of boards is also a concern. So workmanship is the issue. There's a known problem between Flickr and BT / Yahoo accounts. BT aren't about to fix it anytime soon. The solution to this, which Flickr suggested to me, was to give them a non-BT / Yahoo email address to deal with. This was a doddle, once I'd given Flickr a gmail address. It has been problem-free since. I've not sent or received anything from that gmail addy since I set it up.